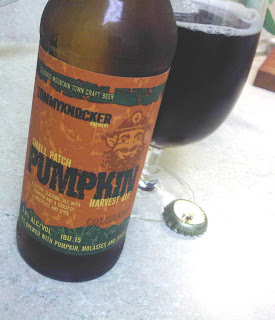 In my previous brew review, I admit that I was categorically dismissive of pumpkin beers. Please accept my apologies for this brief moment of hypocrisy. I try to keep an open mind when trying new foods and writing about them, and my earlier comments were not made in the spirit of this ideal. However, I do find fault with a large number of pumpkin beers available on the American market. Unfortunately, pumpkin does not possess an assertive flavor profile, and when it comes to brewing a pumpkin beer many are forced to do one of two things: 1) add lots of pie spices (e.g. cinnamon and cloves) to trick your brain into thinking its ‘drinking’ a pumpkin pie OR 2) use a lot of artificial pumpkin flavoring. Then end product of these methodologies is almost always decisively unappetizing. But the truly disturbing part of this sordid affair isn’t the poor quality beers rolling out of the mega brewhouses (they’ve been doing that for years), but rather the loss of what is arguably the first truly American style beer. Since the days of the Pilgrims, Americans have proven to be highly adaptable, inventive, and enterprising; and so is the case with our beer! When the early colonists didn’t have barely to make traditional European beers, they turned to other crops. Enter the pumpkin. Americans have been brewing pumpkin beers for as long as there have been Americans. Much to the dismay of George, Ben, and Tom (all of whom were avid home brewers) it is increasingly difficult to find a decent pumpkin beer. The Sam Adams Double Pumpkin tastes like bananas, the Blue Moon version is downright gross, and the Terrapin Pumpkin is anything but memorable. Unfortunately, for many aspiring beer snobs Tommyknocker is an “I’m already drunk and don’t’ care what I drink anymore beer.” While I would never put one of TK’s brews against say the Imperial Chocolate Yeti from Great Divide, I do find that their beers often make for rather enjoyable session drinks. And so it is with the Pumpkin Harvest Ale. At 5.0% ABV this beer is light enough to drink over a long afternoon of college football. And while the flavor of pumpkin isn’t overwhelming, it is well balanced. Color: Deep reddish brown, almost a rich mahogany color. Beer retains a thin, lacy head for the duration. Clear (not opaque) but too dark to allow light to pass through readily. Aroma: This beer’s aroma is very mild, with virtually no hopy citrus presence. The bouquet opens with notes of cinnamon supported by a malty (sweet, with slight twinges of fruit) background. This slowly opens to a more vegetal aroma (slightest presence of something not quite entirely unlike pumpkin). The beer’s aroma closes with the slight aroma of hay/ freshly cut grass. Taste: Surprisingly the taste of this brew opens with a vanilla yet vegetal taste (slight pumpkin) at the top of the palate. This quickly transitions to a light biscuit/ malty center with strong notes of rich spices (cinnamon) on the periphery, before finishing with a slight roasted taste. Mouthfeel: Unfortunately, this beer falls apart in this particular category. Overall, the mouthfeel is week (at least for my preference). The finish on the beer provides a singular, astringent pucker, which I found slightly annoying. Recommendation: This beer is all about drinking with friends over long afternoon. The flavor is varid enough to provide some contrast to the usual bottled horse piss served at tailgating events, and the ABV is low enough to allow you to remember some of the game the next day.